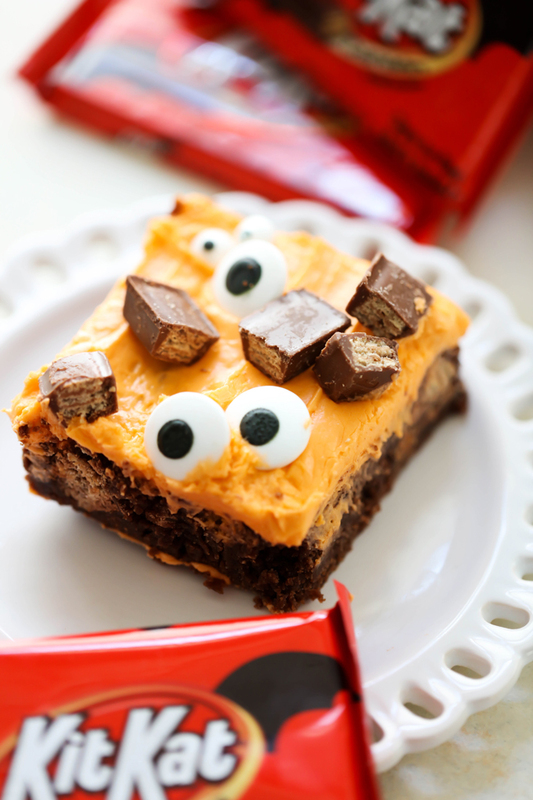 These KIT KAT Halloween Brownies are fudgy and loaded with KIT KAT Candy Bars. They are super cute and festive for the holiday and simple to make! Grease a 9x13 inch baking pan and set aside. In a large bowl, cream butter and sugar together. Add eggs and vanilla and mix until well combined. Add cocoa, flour and salt and stir until well mixed. Stir in chopped KIT KAT candy bars. Pour into prepared baking pan and bake at for 20-25 minutes or until toothpick comes out clean. In a large bowl, cream butter. Add powdered sugar, malted milk powder, milk, vanilla and orange food coloring. Beat until smooth and creamy. Add more milk or powdered sugar depending on the consistency you prefer. Top with chopped KIT KAT Bars and assorted Halloween sprinkles.